A 52-year-old woman presented with acute shortness of breath and bilateral chest pain. Medical history indicated that she had stage IIIb colon cancer under chemotherapy with oxaliplatin and 5-fluorouracil. Clinical examination revealed normal body temperature and non-productive cough. O2 desaturation (70%). Blood exams were unremarkable apart from a slight increase in D-dimer, 280 ng/mL. Chest radiography performed in the emergency department showed bilateral lung consolidations. 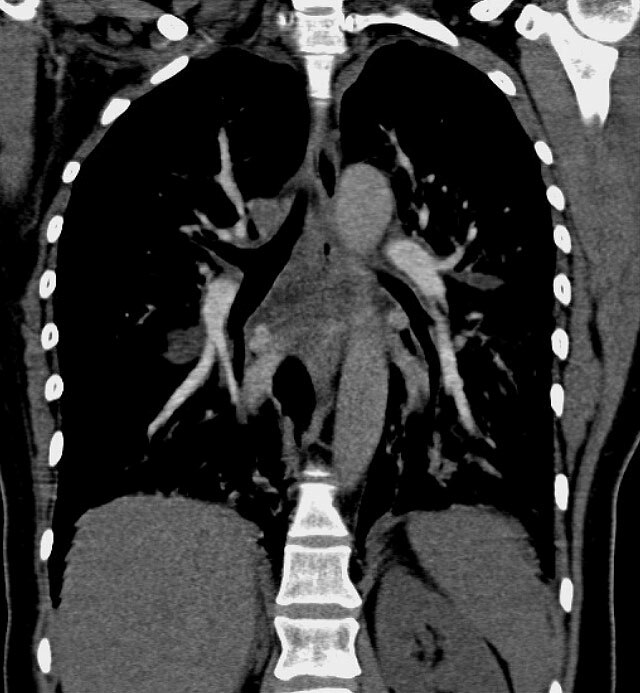 Contrast-enhanced chest CT was performed to rule out acute pulmonary embolism and pneumonia.